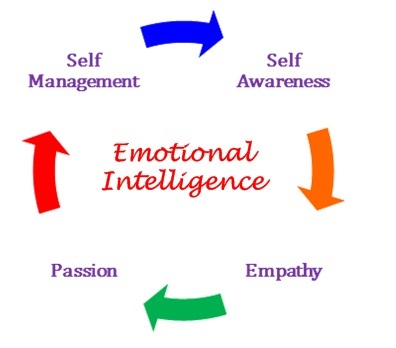 Emotional Intelligence (EI) or Emotional Quotient (EQ) is the ability to identify, assess, understand, and manage emotions of oneself and of others. Emotional intelligence skills are valuable for managing behavior, navigating social situations, and making important decisions. Emotional intelligence is different from general intelligence. Intelligence is a set of cognitive abilities which allow us to acquire knowledge, analyze it, and to apply it solve problems. Intelligence is measured by how quickly and how well new information is processed and learned. Generally, it does not change throughout a person’s life. Conversely, emotional intelligence is an attribute and skill that can be improved over time with practice. EI focuses on the aspects of intelligence that govern self-knowledge and social adaptation. It involves how a person understands oneself and how he or she relates to and perceives others. By understanding how other people feel allows us to manage our relationships more effectively. People with high EI are able to recognize their own emotional state and the emotional states of others. They are able to communicate effectively, empathize with others, reduce personal stress, overcome challenges, and resolve conflict. Developing a strong emotional intelligence helps you recognize and manage your emotions, communicate effectively, build stronger relationships, resolve conflict, and achieve your personal goals.